A big thanks to all who entered the wonderful sets competition, and I really wish I could send everyone a book. However, there can only be one winner and Rob in Denver was first out of the virtual hat. The prize includes all three Hal books and airmail postage - you'll just have to supply the reading part of it. Again, thanks to all who entered and please keep an eye out for more chances to win Hal. For example, this one and this one. If you've followed my blog for a reasonable amount of time (say, two or three days), you'll know that I occasionally give away copies of my books. 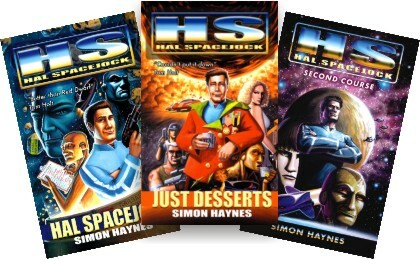 Today is a bit different, because instead of giving away copies to multiple winners, I'm drawing ONE set of Hal Spacejock books 1, 2 and 3. Yes, that's what three books look like. The winner will take the lot, and I'll post them anywhere in the world. All you have to do is leave a comment below telling me why the whole Hal Spacejock thing appeals to you. I'll give it a couple of weeks, then draw one winner at random. Good luck! No, not that kind of death. Nobody gets killed in Hal Spacejock books. They just disappear in a mysterious fashion. When I submitted the Hal 4 outline to my editor, one of the minor characters was a gruff desk sergeant, semi-retired. You know the type - worldly wise, unflappable, full of useful information and a father figure and guiding light to one of the major characters. He was Roger Murtaugh to Martin Riggs, William of Baskerville to Adso of Melk, and any one of those countless wise older hands which populate books and movies. In other words, the perfect example of a cliche character. Anyway, around 1am I found myself mulling over the Ted problem. The lights were off, the house was quiet and I was supposed to be going to sleep, but I never let minor challenges like oncoming unconsciousness distract me. Instead of coming up with a replacement for Ted I decided I'd introduce a third character, an original one which would be great fun to write. I ran a few conversations in my head, and my new creation held up just fine. A few minutes later I realised this new character had already supplanted staid old Ted: everything Ted could possibly bring to the plot this new character could do better, and with laughs to boot. So long Ted, and may you live on in Hollywood buddy movies. Actually, I'm feeling quite good. I mean, apart from having had chronic back pain for the past two weeks AND a sharp pain in my abdomen for which I'm having an ultrasound next week AND a nasty intermittent ear-ache which I only experience when I wake up suddenly in the middle of the night. Of course, some time in the future I'm sure I'll need a cynical older female character, so I can't just delete bits or write over the top of them. First I have to store away every scene, adding to the 700,000 word pile sitting in my 'for future use' folder.